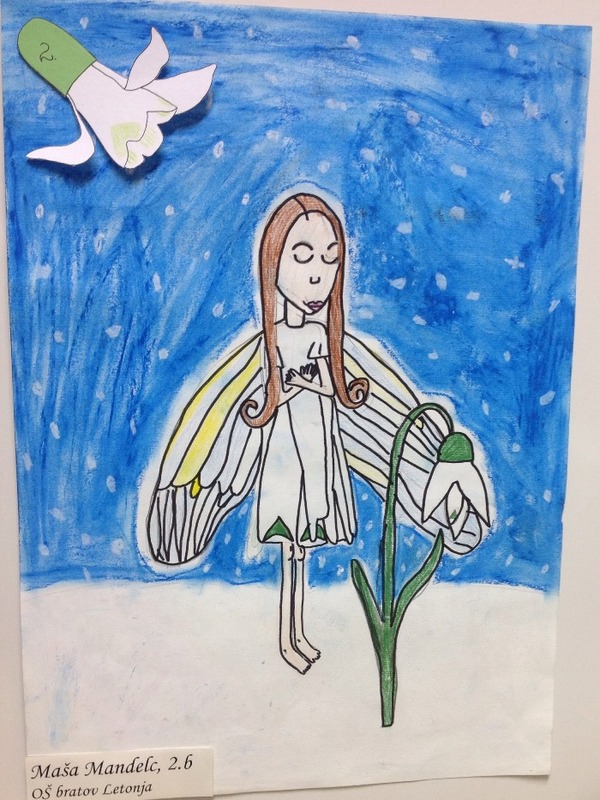 Joint second prize in the school snowdrop art competition. I've spent the weekend in Slovenia, as a guest of the Ljubljana University Botanic Garden, which is hosting the first Slovenian Snowdrop Festival. This has taken the form of a series of guided tours, talks, demonstrations and an art competition. 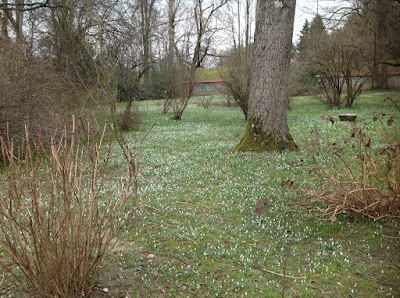 Snowdrops are much appreciated in Slovenia, occurring widely across the country as wild plants, and commonly in gardens. 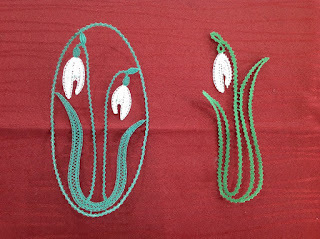 There is an old tradition of picking bunches for the home or for sale in the markets, so they have considerable cultural resonance in the country. The press had also recognised this, and the festival was featured by several television and radio shows over the weekend, even featuring on the main national news. 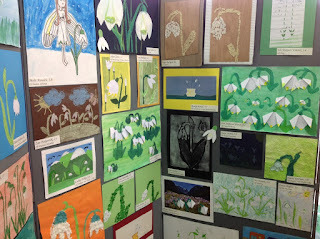 It was fascinating to see how much interest there was in snowdrops, and it was an honour to be involved with the first of what everyone hopes will become an annual event. Many thanks to all the kind people who made my visit so pleasant. 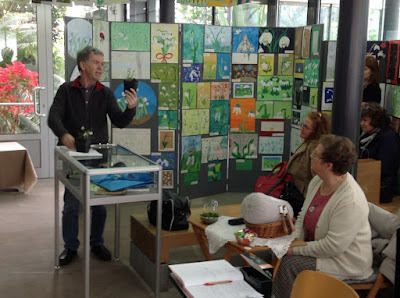 Dr Jože Bavcon, Director of the Ljubljana University Botanic Garden, and pre-eminent Slovenian galanthophile with three books on snowdrops to his credit, explaining the fine points of some of his selections. 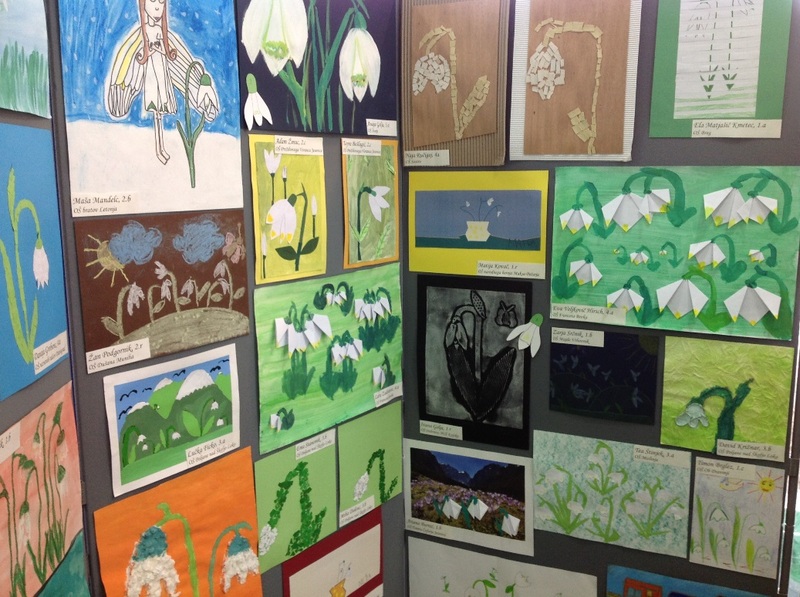 School children from across Slovenia contributed artworks featuring snowdrops - zvoncki - to the competition and the diversity and quality of interpretation was outstanding. 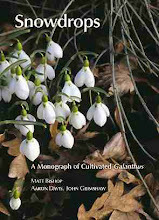 What was extremely interesting was that it was clear that there was a distinction between those children who knew zvoncki to be Galanthus, and those who understood it to mean Leucojum vernum. 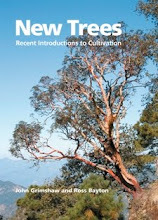 Botanic garden staff could even correlate this to their own knowledge of regions with or without one of the genera. On Friday there was a demonstration of lace-making - a strong local tradition, and a number of ladies produced some beautiful lace snowdrops. 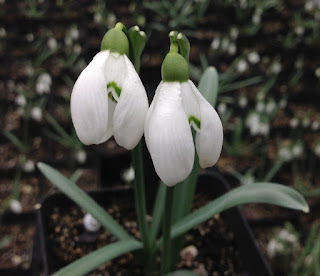 Jože Bavcon has been studying the wild snowdrops of Slovenia for many years, and has an extensive collection in the cold frames, with some extremely attractive and interesting selections. A large-flowered clone of Galanthus nivalis. 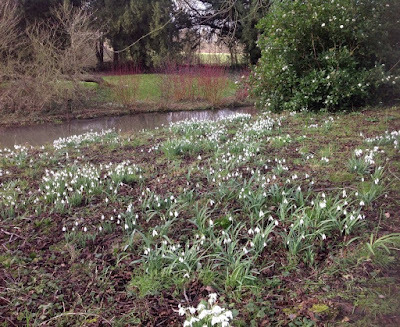 Much of the botanic garden has been colonised by masses of local Galanthus nivalis, with the local Crocus heuffelianus and other early bulbs. It's very interesting to see that these are mostly singletons or in small tufts, and are not clump-forming, very different to the typical clump-forming G. nivalis seen in the UK. Unfortunately the weather was dull throughout the time I was there, so they remained tightly furled. 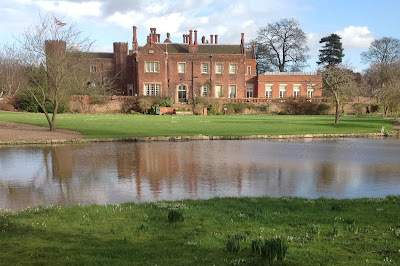 Twenty-five years ago Sir Andrew and Lady Buchanan decided to open their garden at Hodsock Priory, Nottinghamshire, for people to see their snowdrops, the first of the 'big' snowdrop gardens to do so. 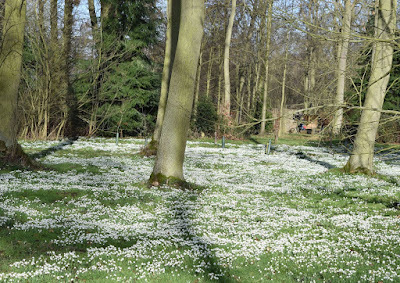 They quickly realised there was a market for snowdrop viewing and developed the garden and adjacent woodland into a winter garden destination, attracting huge numbers of visitors in snowdrop season. The garden was extensively replanted for winter effect under the guidance in the 1990s of Kate Garton and the snowdrop collection and plantings significantly expanded. As with the Elwes family at Colesbourne the Buchanan's connection with snowdrops is ancestral. 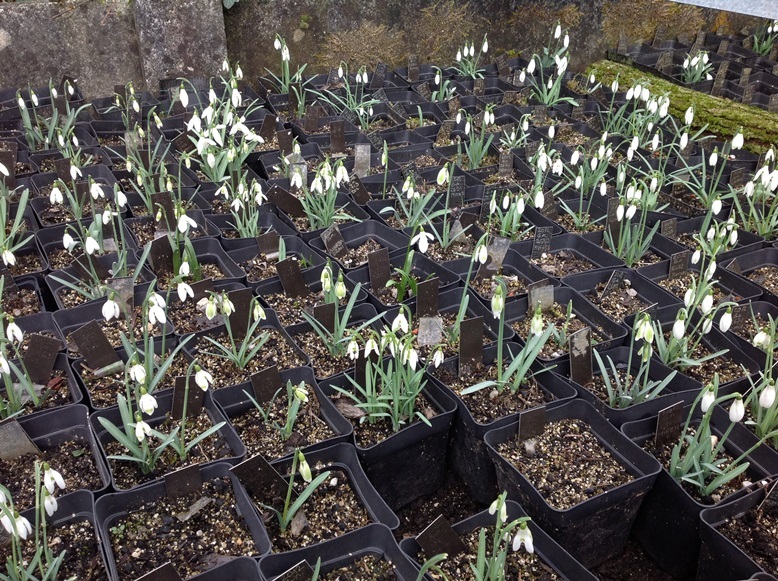 Andrew's grandmother was Lady Beatrix Stanley, commemorated by the eponymous double snowdrop and an Iris histrioides cultivar, and his mother Barbara Buchanan is commemorated by 'Barbara's Double' and 'St Anne's' for her residence. 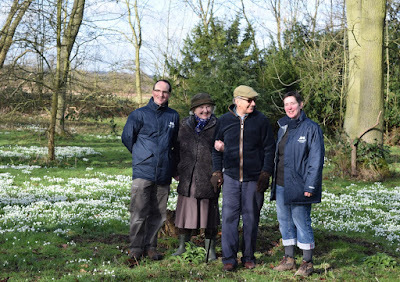 Andrew and Belinda have now passed the reins of the house and garden management to their son George and his wife Kat, who were the hosts this morning at a press day - a miraculously sunny and calm press day, after the terrible recent storms and dull weather. 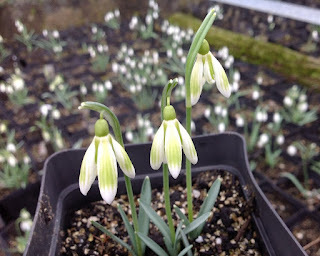 My first contact with Hodsock came in 1997 when I was dispersing Primrose Warburg's collection of snowdrops and other plants from South Hayes. 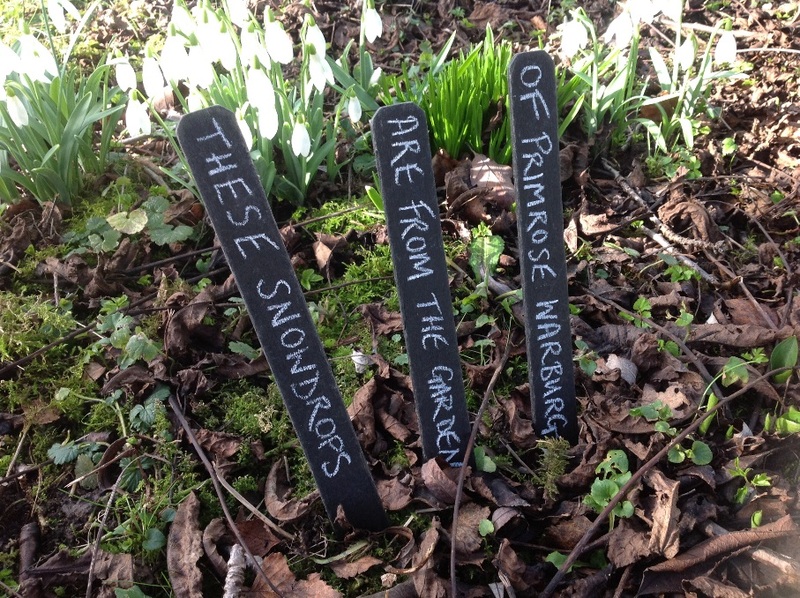 Primrose had acquired a lot of snowdropos from Lady Beatrix's old garden at Sibbertoft Manor and these were grown on a rough bank always called the Sibbertoft Bank, where they had self-sown and produced a number of excellent seedlings. 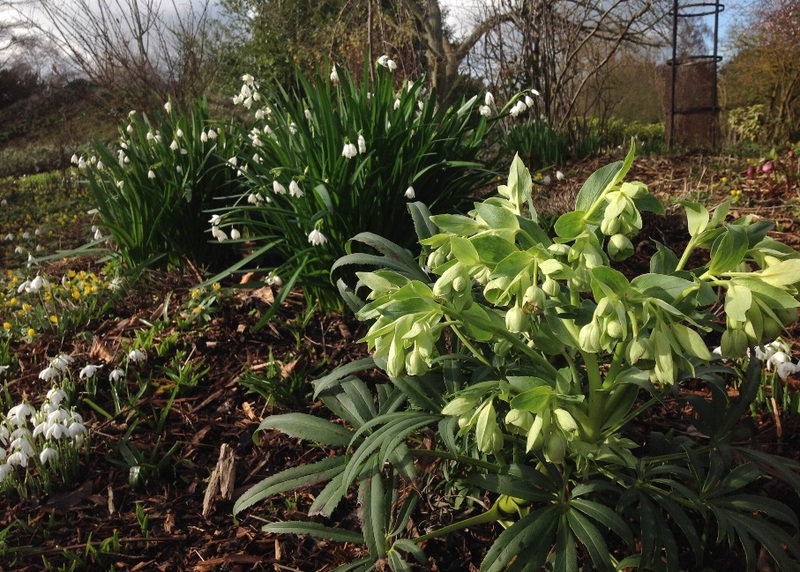 I gave Kate Garton a number of clumps from the Sibbertoft Bank and these were planted in a particular area of the garden at Hodsock - see below. My solitary previous visit to Hodsock had been in the following year, so this revisit was long overdue - it certainly won't be another 17 years before I return! The main display in the woodland area is of Galanthus nivalis 'Flore Pleno' - the common double snowdrop it may be but nothing creates such solid white carpets. Hodsock Priory never was a priory; the main house dates from the 19th C, but the Tudor gatehouse is original. 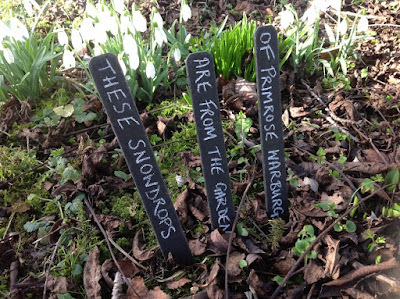 It's good to see that the snowdrops from South Hayes are still remembered and honoured as having come from the legendary Primrose Warburg. 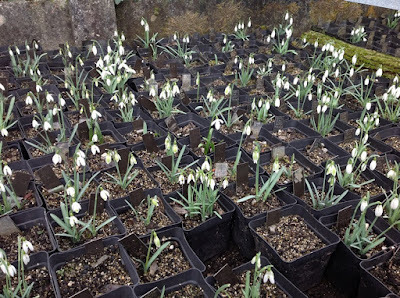 The South Hayes snowdrops have been happily sowing themselves and have made a nice patch of variable G. plicatus (mostly), preserving the Sibbertoft genetics. 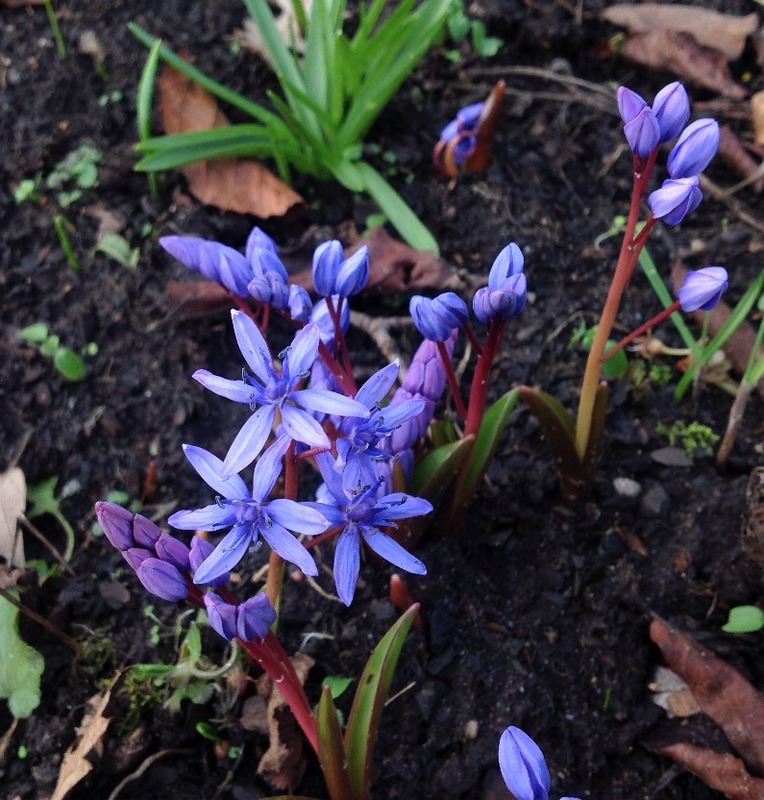 The garden round the house has been planned and planted for winter effect, and was looking good in the bright sunshine today. This large, robust Scilla bifolia, which I've always known as 'Praecox' is a rare plant, but very much associated with the older generation of galanthophiles - it was nice to see it at Hodsock, linking the generations.